The group Centro Sin Fronteras, a parent group to caravan organizer Pueblo Sin Fronteras, is reportedly a mainstay of the caravan effort. The Centro has received funding from the George Soros-financed National Immigration Forum. Excerpt from Chapter 7 of my book "Western Civilization under siege"
Shadowy billionaire George Soros is one of the most politically powerful individuals on earth. Since the mid-1980s in particular, he has used his immense influence to help reconfigure the political landscapes of several countries around the world – in some cases, playing a key role in toppling regimes that had held the reins of government for years, even decades. A strong case can be made for the claim that Soros today affects American politics and culture more profoundly than any other living person. Much of Soros’s influence derives from his $13 billion personal fortune. An equally significant source of Soros’s power, however, is his passionate messianic zeal. Soros views himself as a missionary with something of a divine mandate to transform the world and its institutions into something better – as he sees it. It is instructive to examine the mindset of Soros to perhaps get a better idea of his motives. 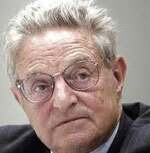 George Soros was born to Tivadar and Erzebat Schwartz, non-practicing Jews, in Budapest, Hungary, on August 12, 1930. In 1936, Tivadar changed his family surname to Soros. When the Nazis occupied Budapest in 1944, Tivadar decided to split up his family so as to minimize the chance that all its members would be killed together. For each of them – his wife and two sons – he purchased forged papers identifying them as Christians, paid government officials to conceal his family’s Jewish heritage from the German and Hungarian fascists, and bribed Gentile families to take them into their homes. As for George in particular, his father paid a Hungarian government official named Baumbach to claim George as his Christian godson, “Sandor Kiss,” and to let the boy live with him in Budapest. One of Baumbach’s duties was to deliver deportation notices to Hungary’s Jews, confiscate their property and turn it over to Germany. [i] Young George Soros sometimes accompanied the official on his rounds. Very few people would describe the suffering and human tragedy during the Nazi occupation of Hungary as the happiest year of their lives. In November 2000, Soros announced that he had conceived a master plan for saving the world. The announcement came in a brief epilogue to his book, Open Society: Reforming Global Capitalism. However, Soros said he could not divulge the plan. It must remain secret for a time. To reveal it, he implied, would be like advertising his intentions on the eve of a major stock market play, where showing his hand might queer the deal. In a June 1993 interview with UK daily, The Independent, Soros, who is an atheist, said he saw himself as “some kind of god, the creator of everything.”[vi] In an interview later, he portrayed himself as someone who shared numerous attributes with “God in the Old Testament” – “You know, like invisible. I was pretty invisible. Benevolent. I was pretty benevolent. All-seeing. I tried to be all-seeing.”[vii] Soros told his biographer, Michael Kaufman, that his “goal” was nothing less ambitious than “to become the conscience of the world,” by using his charitable foundations to bankroll organizations and causes that he deems worthwhile. In 1993 Soros established the flagship of the Soros foundation network – the New York City-based Open Society Institute (OSI). Today Soros’s Open Society Foundations are active in more than 70 countries around the world. GetUp’s founders, David Madden and Jeremy Heimans, are heavily involved in a number of similar U.S. and global left-wing activist groups, each of which is tied to George Soros. GetUp was inspired by, and modeled on, similar U.S. groups, such as MoveOn.org and Win Back Respect. Madden and Heimans were co-founders of Win Back Respect. According to public records published on CampaignDonations.com, when they were drawing expenses from the group in 2004, the major donor that year, with a contribution of $150,000, was George Soros. Madden and Heimans are also involved with another Soros-financed left-wing activist group, MoveOn.org. Public records reveal that between January 2003 and December 2004, Soros contributed $2,500,999 to MoveOn.org. It is clear that GetUp follows the Soros model in Australia. It is set up as a “non-partisan” activist group to harvest contributions that are exempt from Australia’s political donations laws. The corporate entity, Getup Limited does not appear on the Australian Electoral Commission’s list of “associated entities,” even though it claims on its website that is legally obliged to disclose donations over $11,200 to the AEC. Soros, however, is chiefly devoted to injecting capital into American groups and causes. An indication of what Soros really meant by his lofty words was his appointment of Aryeh Neier to serve as president not only of the OSI but of the entire Soros Foundation Network. In 1960 Neier had created Students for a Democratic Society (SDS), which became the largest and most important radical group of the 1960s. SDS aspired to overthrow America’s democratic institutions, remake its government in a Marxist image, and undermine the nation’s war efforts in Vietnam. Following his stint with SDS, Neier spent 15 years working for the American Civil Liberties Union (ACLU) – including eight years as its national executive director. After that, he spent 12 years as executive director of Human Rights Watch (HRW), an organization he founded in 1978. Both the ACLU and HRW have long promoted one of the central contentions of Soros’s Open Society Institute: the notion that America is institutionally an oppressive nation and a habitual violator of human rights both at home and abroad – indeed, the very antithesis of the type of “open society” Soros reveres. The following are just some of the organizations funded by, or receiving donations from, George Soros. The Institute for Policy Studies has long supported communist and anti-American causes around the world. It seeks to provide a corrective to the “unrestrained greed” of “markets and individualism”. The Urban Institute favors socialized medicine, the expansion of the federal welfare bureaucracy, and tax hikes for higher income-earners. Groups in this category typically oppose mining and logging initiatives, commercial fishing enterprises, development and construction in wilderness areas, the use of coal, the use of pesticides, and oil and gas exploration in “environmentally sensitive” locations. Moreover, they claim that human industrial activity leads to excessive carbon-dioxide emissions, which, in turn, cause a potentially cataclysmic phenomenon called “global warming”. Examples of such Soros donees include Earthjustice, Green For All, the Natural Resources Defense Council, the Alliance for Climate Protection, Friends of the Earth and the Earth Island Institute. Another major recipient of Soros’s money is the Tides Foundation, which receives cash from all manner of donors – individuals, groups and other foundations – and then funnels it to designated left-wing recipients. Having given more than $400 million to “progressive non-profit organizations” since 2000, the Tides Foundation is a heavy backer of environmental organizations, though its philanthropy extends into many other areas. The Feminist Majority Foundation “focus[es] on advancing the legal, social and political equality of women with men, countering the backlash to women’s advancement, and recruiting and training young feminists...”. The Ms. Foundation for Women laments that although “women are more than half the [U.S.] population… they don’t have equal opportunity, voice or power”. The National Partnership for Women and Families asserts that “women today are still paid only $0.77 to a man’s dollar” – an assertion that is grossly misleading and substantively untrue. The OSI is not the only vehicle by which George Soros works to reshape America’s political landscape. Indeed, Soros was the prime mover in the creation of the so-called “Shadow Democratic Party,” or “Shadow Party,” in 2003. This term refers to a nationwide network of labor unions, non-profit activist groups and think tanks, whose agendas are ideologically left-wing, and which are engaged in campaigning for the Democrats. This network’s activities include fundraising, get-out-the-vote drives, political advertising, opposition research and media manipulation. In some cases, Soros has taken over the funding of what were once Soviet front groups. [i] Connie Bruck, “The world according to Soros”, The New Yorker, January 23, 1995. Peter Schweizer, Do As I Say (Not As I Do): Profiles in Liberal Hypocrisy (New York: Doubleday, 2005), p. 157. [ii] “Soros helped the Nazis during Holocaust”, partial transcript from an interview of George Soros done by Steve Kroft for CBS’s 60 Minutes program, December 20, 1998. [iii] Glenn Beck, “Making of the puppet master”, Fox News, November 12, 2010: part three of a three-part series on George Soros. Michael Lewis, “The speculator”, New Republic (New York), January 10, 1994. [iv] George Soros, The Alchemy of Finance: Reading the Mind of the Market (New York: J. Wiley, 1987; 1994 edition), p. 362. [v] George Soros, Underwriting Democracy: Encouraging Free Enterprise and Democratic Reform Among the Soviets and in Eastern Europe (New York: Free Press, 1991), p. 3. [vi] Gail Counsell, “The billionaire who built on chaos”, The Independent (UK), June 3, 1993. [vii] Beck, “Making of the puppet master”, op. cit. [viii] Kady O’Malley, “Avaaz.ca vs. Baird: The shadowy foreign organization strikes back!”, Maclean’s (Toronto), October 6, 2008. Kevin Libin, “The third party no one talks about”, National Post (Toronto), September 20, 2010. [ix] Ken Schultz, “GetUp exposed: George Soros’ tentacles reach into Australia”, Australian News Commentary, April 4, 2013. [x] George Soros, Open Society: Reforming Global Capitalism (New York: Public Affairs, 2000), p. 120. [xi] “Bernardine Dohrn”, DiscoverTheNetworks.org (David Horowitz Freedom Center, Los Angeles), a guide to the political left.